Laser hair removal is based on the thermal effect which is shown as follows: there is a dark pigment-melanin which absorbs light laser radiation. While absorbing laser energy a sharp heat throughout hair takes places. An instant temperature increase destroys hair follicle and the derooted hair stops growing. A laser is fitted with software, which allows to set the laser set so that it distributes an impulse strictly dosed by intensity and duration. The follicle manages to die and the surrounding tissues remain unaffected. The peculiarity of laser hair removal is that within one procedure laser impulses affect just on those hair which are actively growing at the time of the procedure. Not more than the fifth part of all hair is in such state. Accordingly hair in “sleep” state cannot be affected by laser. That’s why a range of procedures on skin (with 1,5-2 month interval) is needed for a complete hair removal. GentleLASE PRO is a“ laser doctor of the newest format. The effectiveness of laser hair removal on 99 per cent depends on which kind of laser device it is performed. In our clinical center Avanta hair removal is performed with the application of the latest laser technology – GentleLASE PRO system of American company Candela. For the moment it is the only device with fixed unique system of dynamic skin cooler. GentleLASE PRO is created on the basis of long term world experience in the field if laser hair removal. It works quickly and effectively and is recognized by the specialists all over the world as a gold standard of technologies in this field. While working with GentleLASE PRO there is no need of skin anesthesia: within 3 ms before laser beam flashing a liquid freon (a clean and safe coolant) is headed to the corresponding skin area. That’s why the skin doesn’t have time to overheat at the moment of laser exposure. With Candela GentleLASE PRO you will need substantially less number of procedures than working on laser device of other model! Laser hair removal or photo epilation? Of course, laser hair removal! For the practical expertise of specialists of our center, as well as the experience of our colleagues – cosmetologists and dermatologists it proves: today only laser hair removal on Candela GentleLASE PRO unit has the right to be called ” №1 technology », by its efficiency outstripping light (photo-) and electric types of epilation. laser hair removal at our medical center is carried out at the most reasonable price in Armenia! How to prepare to laser hair removal? If you are going to do hair removal in our center, for the greatest effectiveness of the procedure and in order to avoid the risk of burns the procedure of sunbathe is not recommended 2 weeks prior the procedure. Also, two weeks before hair removal refuse pulling out hair (wax, epilator, forceps). Laser hair removal is performed on the hair not longer and not shorter than 1-2 mm. So 2-3 days before the procedure, shave the hair in the area that is to be processed (except for areas on the face of women). The client wears glasses which protect eyes from laser shots, and is conveniently arranged on a couch. 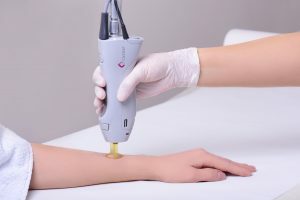 An experienced physician evaluates the patient’s skin type and hair color, sensitiveness of the areas to be exposured and on this basis by a computer program adjusts the laser unit – individually for each patient. Then the doctor takes the device manipulator and starts to rub it over the skin. The device emits short laser pulses, before each of which a skin dynamic cooling system is automatically activated. As a rule laser hair removal does not cause unpleasant sensations. Laser hair removal procedure, depending on the size of the treated area may continue 10-60 minutes. You need to know that the hair after laser treatment does not fall instantly (except for areas of the face), but over the next 10-14 days, and then they will not annoy for one and a half to two months (except for areas of the face where hair will disappear at once). Upon completion of the procedure, a protective cream is applied on the exposed skin. What rules should be observed after laser hair removal? In case of light skin redness after the procedure use а dermatic recommended by doctor. Keep from sunbathing for 7-14 days. If you do not want to wait for 10-14 days until the dead hair on the treated areas of skin laser fall out themselves, you can remove yourself by tweezers, razor or depilatory cream. 10-14 days after a session of laser hair removal and up to a new one, it is not recommended to remove hair by wax or epilator; in case of necessity you can use depilatory cream, mousse or scissors. One should make an appointment for repeated hair removal as soon as hair grow back. Preparations for repeated sessions are the same as for the primary procedure of laser hair removal. It is necessary to shave hair 2-3 days before the procedure (so that the length of the hair on the procedure was no more and no less than 1-2 mm). For the profound disposal of unwanted hair one must go through on the average 5-8 sessions of laser hair removal in our medical center. The first interval is usually about one and a half month, later time intervals between treatments increase. The effectiveness of hair removal depends on your skin type, hair color, the areas to be treated as well as whether there is a tan on the skin. For the successful and efficient performance of laser hair removal, one should carefully follow all our medical advice! After a course of laser hair removal hair will no longer grow on the treated areas. In rare cases, for a variety of reasons when hormonal disruptions occur in the body of the patient, hair can still appear – but this fact has nothing to do with the quality of laser hair removal.